Is There a Downside to Investing in Gold? Subject: Is There a Downside to Investing in Gold? Gold has a strong pull both emotionally as well as intellectually. Investing in gold at the moment has become very popular due to the volatility in the market worldwide and to its above-average performance so far in 2016. According to Money Morning Global Credit Strategist Michael Lewitt, we're heading for a Super Crash and gold can protect investors against the price inflation that will kill the value of paper currencies and anything priced in those paper currencies, like stocks and bonds. Yet, before you load up, know that gold investing isn't risk-free. Also, you should always study an investment before diving in. We are supportive of gold investing, but so you can decide if it's right for you, we put together the following info on investing in gold today. As a general rule, gold prices can be very volatile. It isn't uncommon for the price of gold to rise or fall 15% in a 12-month period. Speculators can also cause dramatic gold price swings. Whether you see this as a pro or con depends on your investment outlook. While the world seems to be in somewhat of a mess financially right now, it isn't like we haven't been here before. In fact, this was precisely the case several years ago when gold went from its high of $1,800 to losing ground fast. The weakened dollar came back to life and momentum in the market shifted once again. Luckily, many experts don't believe that it will happen anytime soon, if at all. But it's good to be aware of the gold price history. If you own physical gold, it isn't nearly as liquid as other investment assets. Making a decision to sell your gold requires that you locate a dealer and arrange secure transport of the material, which involves additional cost. Also, when investing in gold, you can't liquidate a part of your holdings, such as half of a gold bar or coin. While there are a few industrial applications for gold, its main use is ornamental. Jewelry is under pressure in various parts of the world but more so in India, where the import tax for gold has doubled in the past decade to 10%. While there are a few downsides to investing in gold, the advantages outweigh these for many individual investors. Gold is an investment that is accessible to just about anyone and it is universally valued, no matter what country you are located in. Also, gold has historically been an effective inflation hedge, and this is expected to continue in the long term. Finally, gold is an excellent investment in times of economic unrest and is an ideal way to diversify a portfolio. Investors' love of gold shows no signs of cooling in 2016. Whether it be gold stocks, gold coins, or gold bars, people are investing in gold in record numbers, and many analysts remain bullish on the precious metal. As you consider joining the current gold rush, remember the potential downsides to this type of investment and don't forget to keep your portfolio diversified. 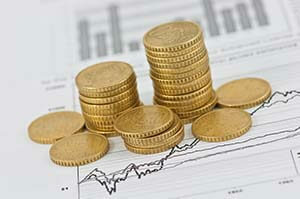 For more information and tips, check out our report: The Essential Guide to Buying Gold & Silver.